Workshop equipment specialists, Techplus has added the tintman photoptic vehicle tint tester to its ever-growing product portfolio. 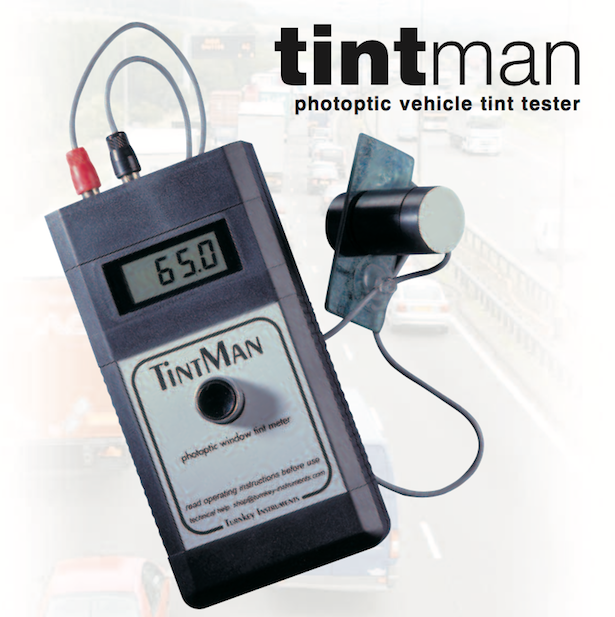 From the same stable as the Turnkey G-meter and Brakesafe, tintman is a photoptic vehicle tint tester that has been designed to quickly and accurately measure the light transmission through all types of vehicle windows to check compliance with road vehicle regulations. With concern about the effect of the sun’s harmful rays, tinted vehicle glass is increasingly being used for solar heat control and blocking ultraviolet radiation. Tinted glass does protect the occupants and internal materials from the sun’s rays but it can have an adverse effect on the driver’s visibility. To measure the transmission, tintman uses a stabilised lamp which emits an intense parallel beam of white light. The lamp is attached to the windscreen with a suction pad and a light detector, with a colour sensitivity which exactly matches the human eye, is placed on the other side of the glass. Like our eyes, the detector is blind to infra-red and ultra violet radiation. When placed near the glass, the detector is automatically aligned and held to the lamp magnetically. Pressing a single button then indicates the percentage transmission of the glass on an illuminated display. Since both the lamp and detector are just 30mm in diameter, the transmission of curved glass and even crash helmet visors can be measured too. The parallel beam of light emitted by the lamp means that errors due to different glass thickness are virtually eliminated, and its high intensity stops bright sunlight interfering with the measurement. At any time the user can check the accuracy of the instrument against the reference window or an open 100% spacer ring supplied with tintman. tintman is supplied with carrying case, reference plastic, 100 per cent spacer, batteries and a calibration certificate traceable to national standards. For more information on tintman contact Techplus on 01 404 9060.